New collection of essays now published! I’ve got another new book out – Antibodies, Anarchangels and Other Essays. This is a prequel rather than a sequel to The Anarchist Revelation and draws together various bits of writing I’ve done over the last few years. There are some newer pieces, including the introduction. The article on state terrorism will be new to most readers, as well. A new collection of writing by Paul Cudenec has been published by Winter Oak Press. Antibodies, Anarchangels and Other Essays brings together a selection of work by the author of The Anarchist Revelation, published earlier this summer. Cudenec calls for a new deeper level of resistance to global capitalism – one which is rooted in the collective soul not just of humankind but of the living planet. He leads us along the intertwining environmental and philosophical strands of Antibodies, through the passion of Anarchangels and The Task and on to a cutting analysis of Gladio, a state-terrorist branch of what he calls the “plutofascist” system. Also included, alongside short pieces on Taoism and Jungian psychology, is an interview with the author, in which he explains key aspects of his approach. Peter Marshall, author of Demanding the Impossible: A History of Anarchism and Nature’s Web: An Exploration of Ecological Thinking, has described Antibodies as “very readable and profoundly thoughtful… Many new insights on the destructive relationship between the greater part of humanity and the planet which tries to sustain them”. 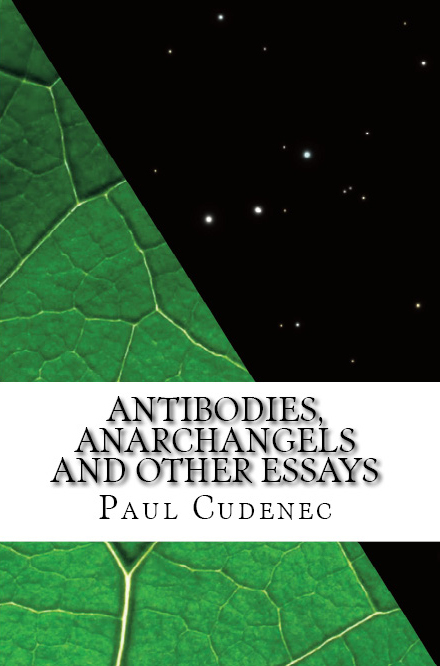 Antibodies, Anarchangels and Other Essays is 154 pages long and is available at £7.99 in the UK, $11.99 in the USA and Euros 9.62. The Kindle version can be had for a special price of just 77p in the UK, $1.18 in the USA and 0.89 Euros. I feel obliged to point out that I did not write this text in the usual manner – rather it came to me, in its entirety, as a dream in the early hours of a Saturday morning not so long ago. I was, at the time, recovering from a rather unpleasant virus and had repaired to bed considerably earlier than usual – and with a head uncharacteristically unclouded by alcohol. When I awoke at around 5.30am, my mind was overflowing with the words you will shortly be reading and I immediately rushed downstairs to my computer and began tapping them out, before they were forever lost to me. Over the following few weeks I looked back over a number of books I had been reading of late, along with the notes I had made from them, and established correlations with themes and rhetoric in the dream text. I have included these probable sources of inspiration as endnotes which I suggest are better read separately; not as an interruption to the main text, but a kind of subsequent commentary, albeit of a rather disjointed kind. While these literary sources go some way to explaining the presence of certain ideas and arguments, I have little idea as to the origins of the tone in which the essay is expressed. It is not a voice I entirely recognise as my own and seems somehow to belong to a much earlier age, despite the scattering of contemporary references. There is not much more I can say that this; I assume the text was given to me so that I should share it further afield and this I am now doing. Do not be afraid for we are ANARCHANGELS and we have risen up from amongst you to set you free and save our world. We have known for so long that this realm into which we were forced to become manifest, this civilisation in which we are all suffocating, is corrupt with rank and wretched decay. We know this from the dead eyes of the human robots thronging the passageways of the commuter rail networks, the factories and the schools. We know this from the computer-readable price tags laser-burnt onto every blade of grass, every butterfly wing, every feeble sapling by the eager adepts of the Cult of Quantity. We know this from the dripping limbs torn from small children, the blood and the grief and the screams of eternal suffering which are distilled and diverted to fill the bank accounts of the yellow-eyed death-mongers. We know this from the happy couple Gluttony and Poverty, who march hand in hand round and round the globe to keep up with the daily opening of the international stock exchanges. So sweet together and each so indispensable to the other! We know this from the fear in the hearts of the powerful, the ignorance in the minds of the dispossessed, the anger in the blood of all those who have seen through it all and yet still can change nothing. We know this from the prisons, the courts, the surveillance cameras, the baton-wielding slave-thugs always ready to pounce on and destroy any faint stirring of that tender precious freedom called revolt. We know this from our own despair, our own incomprehension, our own rage, our own failures, our own sorrow, our own deadly yearning to break out of this lonely nightmare for once and for all. We know this because we know. And we know that it must all be destroyed. We will not hear of this shallow argument. It should be clear from what we just said that our destructive desire flows from the most positive of sources. Behind our whole critique of this benighted civilisation is a deep sense of value. This may even once have escaped us ourselves, so caught up were we in the emotion and pain of our spiritual dislocation. But when we look again at all that hurts us most, we see that underlying it all is the absence of the values that we cherish. We worship life, truth, beauty, nature, the freedom of all creatures to live to their potential, a striving towards perfection and an understanding of the cosmic whole. Nothing can stand in the way of its addiction as it gorges itself on its own body and spews acid abuse in the face of those who say this cannot go on. But of course it can never reveal itself to be the beast it is. Instead it turns the picture upside down and presents itself as the protector of values – and ourselves, we Anarchangels, as the threat to all that is good and proper. These shallow pseudo-values are so lacking in substance that you would perhaps have imagined that nobody could be idiot enough to take them as real. Thus it was that the mass murderer Hitler persuaded the German people that he was the saviour of their noble culture, by cunning use of pomp and propaganda. Thus it is that the black magicians of contemporary times can have (almost!) an entire people believe that their cultural inheritance, liberties, identity, dignity and future can be represented by a motley collection of historical individuals, events and developments. Sometimes these are presented proudly in the plastic packaging of globalised consumerism and on other occasions, when it suits, they are all wrapped up in a musty old piece of multi-coloured cloth. The totem, with nothing in reality behind it other than the need for control over the population, can then be wielded as and when necessary to the desired effect. With one wave of the magic rag, their eyes are drawn away from the conjuror’s accomplices busy picking their pockets, stealing the food from their tables, corrupting their children. Don’t ask the meaning of a religion, just obey its rules and keep your mouth and mind closed! Keep telling yourself that the Emperor has a fine set of new clothes otherwise you may find his Anti-Terrorist Squad kicking in your front door! The ‘traditions’ and ‘culture’ that (just about) hold this civilisation together have the depth of a cinematic stage set, the authenticity of a theme park ride. The judge’s wig, the businessman’s suit, the monarch’s crown are all just flimsy substitutes for real content, real tradition, real value. Given that this is so, it may seem possible that our own authentic values could be nurtured in such a way as to show up their hollow version for the fraud it is. This is a fine idea, and an appealing one, but unfortunately takes no cognisance of the depressing reality at which we have arrived. The system of power understands all too well the threat of an alternative source of value or tradition, the potential of parallel social or cultural structures arising beyond its control. It had to understand this, and defeat it, in order to have achieved its monopoly in the first place. This is why heretics have been put to death, witches burned, land enclosed, restrictions imposed, education controlled, taxes enforced, borders patrolled, media regulated, dissidents imprisoned, organisations infiltrated, initiatives disrupted, authors discredited, travellers moved on, squats evicted, protests banned, email intercepted, web servers seized, public opinion assiduously manipulated. The hunger of Progress (12) demands spiralling sacrifices of our planet’s living flesh and its servants need ever more power to carry out its orders. If they do not crack the whip and impose its will then they have failed in their appointed task. Be sure that this system will do just what it has to do in its lust for power. It will stop short of nothing. It is not going to stand idly by and watch us build its replacement under its very nose. It is not going to be won over by the niceness of our actions or the kindness of our tone into letting us get on with a project that it knows could undermine its existence. The malignant growth we term civilisation is not going to allow healthy cells of life to get in the way of its fatal expansion. It does not threaten and intimidate opponents because they are criminals, though that is inevitably its public justification. It does so because they threaten its monopoly and it cares little whether they do so by way of insurrection or agricultural commune. The Diggers of George’s Hill had no molotov cocktails concealed beneath their 17th century tunics and still they were crushed under the boot of power. This does not mean we should not embrace creativity and show by our example that there are better ways to live. But we will always need to be ready to fight to defend our vision. Indeed, we have always needed to be ready to do that. We have fought over and over again, throughout history. We have to admit we have generally been defeated – otherwise we would not find ourselves where we are today. But the struggle itself has been a victory of sorts, a flame kept burning and an inspiration for those to come. It is these battles, however tragic their conclusion at the hands of the dark forces, that have given birth to each new generation of Anarchangels. You don’t need us to tell you this. Deep down you knew already, but were unwilling to face up to the enormity of the implications. If your house was structurally unsound, right down to the foundations, would you try putting a new roof on it and seeing if that helped? If the cancer of this civilisation is not cleansed from our collective body it will return to colonise any new growth we have managed to inspire. It will draw strength from the fresh energy, absorb the juices and rise up again to reimpose its vicious stranglehold. We Anarchangels know it will not be easy to kill this system, this civilisation. If it was easy it would have been accomplished long ago. But we know that it has to be done and we know that it is our task to try to do it. We cannot separate in our minds the noble values that inspire us from the means with which we can enable them to prevail against the heavy decay that oppresses us all. We cannot separate them because they are, in fact, the same thing – two aspects of one incandescent guiding star. If we create an authentic alternative we are, as the powerful know full well, attempting to destroy the current system. And if we attempt to destroy the current system we are, as we Anarchangels know full well, trying to allow the authentic alternative to come into being. Creation is destruction. Destruction is creation. This is our faith and this is what drives us on towards our destinies. We listen with interest to those who tell us that this is all meant to be and we are living towards the end of a great cycle of history. The age foretold in these writings sounds very much like our own and here we can see its lack of values stripped down and made yet more plain. Multiplication lies at the heart of it all – move still further from the light of simplicity and everything just falls apart. Religions focus more and more on the detail and the dogma rather than on the eternal truth that inspired them. Science splinters and specialises, focusing on smaller and smaller detail and becoming more interested in the material application of its findings than in how they contribute to our understanding of the universe. Mass society lends the appearance of unity but in fact its bringing-together is a tearing-apart, as individuals become isolated, addicted to their own egos and have no sense of any selfless role in the working of it all. The writings say that Kali Yuga is accelerating ever faster towards its doom, like a stone rolling down a mountainside (15) and that it will end in destruction (16), followed by the dawning of a new Satya Yuga. For we know that we have work to do. The water wheel of history will not turn by itself and we are the droplets who must converge to power the change. But that doesn’t mean it comes easily, lazily, without effort – and there are some who will drop back, useless and unfulfilled, like a spermatozoon unfit to fertilise an egg. A fallen anarchangel will plunge, wither and be sucked back into a dark vortex of their own unopened potential, now turned inwards to bitterness and a stunted self. But we others – we angel-droplets, we swim-sprinting spermatozoa, we creative destroyers of the Kali Yuga – will play out our role with determination and pride. 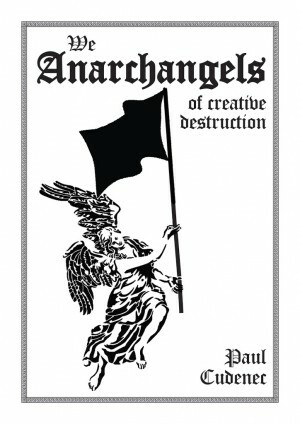 How many Anarchangels does it take to bring down a civilisation? More than we are now, that is for sure. But we will swell in size and strength as others flow into our stream and turn it into a mighty river. Don’t forget that it rains all the time. Life-moisture expended and drawn up into the ether is formed again and joins us here on Earth. Regeneration means new generations and these are born to play their part in the ending of an age. The death-power is strong and could not be defeated by the energy of risings past. But each time we come back stronger and in greater numbers. Each time we know less fear and we understand more fully just how far we have to go. This will happen again and again until we have won. Sin miedo (19). Nothing can stop us. Anarchangels don’t just fight to win, we fight to show the way, to sound the trumpet of revolt (20). Our rage inspires an electric force that draws in others to our rebellion – even babies in the womb are infused with its necessity and grow up to discover why it is they are here and what it is they now must do. Through this resonance we can transmit from our halo-antennae not just the riotous fury of our cause but the joyful values we uphold. These values we hold dear contain the knowledge that the corrupted present must be rent asunder. Birth and death. Death and birth. Neither comes first, neither is more important than the other. They are one and that knowledge is what binds us to our duty. We must make ourselves strong, fellow Anarchangels, through some alchemy of the soul! Now we must speak of our values and how it is that we would hold on to them throughout the great falling of the Darkest Age. Deep down, we know, these values are as much a part of us as we of them and must forever lie inside our souls, all ready to unfold. All would not be lost, therefore, if every memory of culture were wiped out and we began again, in naked innocence. Eventually, it would all come back to us in our dreams. But we need not waste the precious heritage we own and our aim is to carry it with us through the coming storm. Just as a civilisation at its peak carries the seed of its own destruction, so a civilisation at its lowest point contains the seed of a future rebirth. We anarchangels must be custodians of this seed so that we can plant the tree of wisdom in the coming Golden Age. Like Ariadne’s thread, this knowledge can lead them and us away out of the dark and perplexing labyrinth of earthly existence and into the light of understanding. These sacred values can’t be found on the surface of this dying age. The books that teach them won’t be stacked up in Tesco, turned into a three-part mini-series on Channel 4 or liked by millions on Facebook. These are the values we began by defending, before the fury of the struggle itself left us drifting without sight of how it all began. But although these values are not spelled out in neon lights or declaimed by the high priests of football at half-time in the Champions League Final, they do still exist and can be found. There they are on the lips of a wise woman, there they are between the lines of the world’s religions, there they are in that inauspicious tome in a secondhand bookshop that somehow, for reasons you can never explain, you find yourself reaching for and taking home to read! These are our human values, these are our natural values, these are the values by which we are intended to live. If that were not so, they would by now have disappeared down the plughole of the millennia and drained away into a forgotten past. And when this system is destroyed, when we have played our appointed part in the ending of this Kali Yuga, when anarchy has prevailed, when the blockage in the fountainhead has been removed and the spring of life is flowing as it should (30), then those values will surface again, triumphant and supreme. The Golden Age will have returned and we Anarchangels will rejoice! 1. Hermann Hesse, Demian, Peter Owen, London, 2001, p181. 2. Gustav Landauer, Revolution and Other Writings: A Political Reader, edited and translated by Gabriel Kuhn, PM Press, Oakland, 2010, p74. 3. “To be fully at ease in a limited sphere, whatever it may be, one must be blind to the possibility of there being anything beyond.” René Guénon, East and West, Sophia Perennis, Hillsdale NY, 2001, p53. 4. Guénon defines progress as “a profound decadence, continuously accelerating, which is dragging humanity toward the pit where pure quantity reigns.” René Guénon, The Reign of Quantity and the Signs of the Times, Sophia Perennis, Hillsdale NY, 2004, p61. 5. “Just as an individual can be hostage in the abyss of addiction, so can an entire epoch or culture. This is true for our epoch, which is plunged into the World’s Night. Western civilisation is experiencing a Dark Night of the Soul due to our self-asserting will to control, epitomized by the technology that we expect to provide us with a secure, happy and comfortable life.” Linda Schierse Leonard, Witness to the Fire, Creativity and the Veil of Addiction, Shambhala, Boston & London, 1990, p197. 6. “What the modern world has striven after with all its strength, even when it has claimed in its own way to pursue science, is really nothing other than the development of industry and machinery; and in thus seeking to dominate matter and bend it to their service, men have only succeeded, as we said at the beginning of this book, in becoming its slaves.” René Guénon, The Crisis of the Modern World, Sophia Perennis, Ghent NY, 2001, p87. 7. “Modern civilisation suffers from a lack of principles, and it suffers from it in every domain. By a monstrous anomaly, it is, alone, among the others, a civilization without principles, or with only negative ones, which amounts to the same thing. It is as if an organism with its head cut off went on living a life that was at the same time intense and disordered…” Guénon, East and West, p106. 8. “The great ability of those who are in control in the modern world lies in making the people believe that they are governing themselves.” Guénon, The Crisis of the Modern World, p74. 10. “What does the truth matter in a world whose aspirations, being solely material and sentimental and not intellectual, find complete satisfaction in industry and morality, two spheres where indeed one can very well do without conceiving the truth?” Guénon, East and West, p13. 11. Landauer famously wrote: “The state is a social relationship; a certain way of people relating to one another. It can be destroyed by creating new social relationships; ie, by people relating to one another differently.” (Landauer, epigraph) But his views were more complex than might be realised by a superficial reading of this comment (see 13). Guénon, East and West, pp23-24. “The materialists, with all their boasted ‘good sense’ and all the ‘progress’ of which they proudly consider themselves to be the most finished products and the most ‘advanced’ representatives, are really only beings in whom certain faculties have become atrophied to the extent of being completely abolished.” Guénon, The Reign of Quantity and the Signs of the Times, p106. 13. “During the time of revolution, those men are the greatest who most decidedly and effectively negate.” Landauer, p150. 14. “According to all the indications furnished by the traditional doctrines, we have in fact entered upon the last phase of the Kali-Yuga, the darkest period of this ‘dark age’, the state of dissolution from which it is impossible to emerge other than by a cataclysm, since it is not a mere readjustment that is necessary at such a stage, but a complete renovation.” Guénon, The Crisis of the Modern World, p17. Joseph Campbell describes the Jains’ vision of a similar dark age: “The days will be hot, the nights cold, disease will be rampant and chastity nonexistent. Tempests will sweep over the earth and toward the conclusion of the period these will increase. In the end all life, human and animal, and all the vegetable seeds, will be forced to seek shelter in the Ganges, in miserable caves, and in the sea.” Joseph Campbell, The Hero With a Thousand Faces, Fontana Press, London, 1993, p264. 15. “The increase in the speed of events, as the end of the cycle draws near, can be compared to the acceleration that takes place in the fall of heavy bodies: the course of the development of the present humanity closely resembles the movement of a mobile body running down a slope and going faster as it approaches the bottom.” Guénon, The Reign of Quantity and the Signs of the Times, p43. 16. “The course of the manifested world toward its substantial pole ends at last in a ‘reversal’, which brings it back, by an instantaneous transmutation, to its essential pole; and it may be added that, in view of this instantaneity, and contrary to certain erroneous conceptions of the cyclical movement, there can be no ‘reascent’ of an exterior order following the ‘descent’, the course of manifestation as such being always descending from the beginning to the end.” Ibid, p163 (footnote). 17. “Man is not restricted at any stage to the passive role of a mere spectator, who must confine himself to forming an idea more or less true, or more or less false, of what is happening around him; on the contrary, he is himself one of the factors that intervene actively in the modification of the world he lives in; and it must be added that he is even a particularly important factor, by reason of the characteristically ‘central’ position he occupies in that world.” Ibid, p116. 18. See Paul Cudenec, Antibodies – life, death and resistance in the psyche of the superorganism, 2010. 19. Without fear. A slogan of the 2011 “Spanish Revolution”, inspired by the Arab Spring of the same year. 20. “This is the destiny of revolution in our times: to provide a spiritual pool for humanity. It is in revolution’s fire, in its enthusiasm, its brotherhood, its aggressiveness that the image and the feeling of positive unification awakens; a unification that comes through a connecting quality: love as force.” Landauer, p170. 21. “The modern hero, the modern individual who dares to heed the call and seek the mansion of that presence with whom it is is our whole destiny to be atoned, cannot, indeed must not, wait for his community to cast off its slough of pride, fear, rationalized avarice, and sanctified misunderstanding. ‘Live,’ Nietzsche says, “as though the day were here.’ It is not society that is to guide and save the creative hero, but precisely the reverse. And so every one of us shares the supreme ordeal – carries the cross of the redeemer – not in the bright moments of his tribe’s great victories, but in the silences of his personal despair.” Campbell, p391. 22. “In order for a fundamental turn to take place in our time, in order for a spiritual transformation to occur, there must be those who venture into The Abyss and encounter it… The ground must be prepared for the divine radiance to shine and be seen.” Paraphrasing of Heidegger by Schierse Leonard, p199. “He is resolved to forget that the desperate clinging to the self and the desperate clinging to life are the surest way to eternal death, while the power to die, to strip one’s self naked, and the eternal surrender of the self bring immortality with them.” Hermann Hesse, Steppenwolf, Penguin, London, 2011, p76. Stephen A Hoeller, The Gnostic Jung and the Seven Sermons to the Dead, Quest, 1994, p175. 24. “We do not intend to flee from the vita activa to the vita contemplativa, nor vice versa, but to keep moving forward while alternating between the two, being at home in both, partaking of both.” Hermann Hesse, The Glass Bead Game, Vintage Books, London, 2000, p223. 5. “Isolated societies, dream-bounded within a mythologically charged horizon, no longer exist except as areas to be exploited. And within the progressive societies themselves, every last vestige of the ancient human heritage of ritual, morality, and art is in full decay.” Campbell, pp 387-388. 26. “True history might endanger certain political interests; and it may be wondered if this is not the reason, where education is concerned, why certain methods are officially imposed to the exclusion of all others; consciously or not, they begin by removing everything that might make it possible to see things clearly, and that is how ‘public opinion’ is formed.” Guénon, East and West, p15. 27. Warns Hoeller: “The ‘new age’ optimism and superficiality of those who reduce the dark mysteries of Jung’s Gnosis to the shallow level of their own limitations are apt to make people into the victims of the very unconscious they tend to treat so lightly.” Hoeller, p203. 28. “Let there be no confusion on this point: if the general public accepts the pretext of ‘civilization’ in all good faith, there are those for whom it is no more than mere moralistic hypocrisy, serving as a mask for designs of conquest or economic ambitions. It is really an extraordinary epoch in which so many men can be made to believe that a people is being given happiness by being reduced to subjection, by being robbed of all that is most precious to it, that is to say of its own civilisation, by being forced to adopt manners and institutions that were made for a different race, and by being constrained to the most distasteful kinds of work, in order to make it acquire things for which it has not the slightest use. For that is what is taking place: the modern West cannot tolerate that men should prefer to work less and be content to live on little; as it is only quantity that counts, and as everything that escapes the senses is held to be non-existent, it is taken for granted that anyone who is not in a state of agitation and who does not produce much in a material way must be ‘lazy’.” Guénon, The Crisis of the Modern World, p92. 29. “It would not be too much to say that myth is the secret opening through which the inexhaustible energies of the cosmos pour into human cultural manifestation. Religions, philosophies, arts, the social forms of primitive and historic man, prime discoveries in science and technology, the very dreams that blister sleep, boil up from the basic, magic ring of myth.” Campbell, p3. “It has always been the prime function of mythology and rite to supply the symbols that carry the human spirit forward, in counteraction to those other constant human fantasies that tend to tie it back. In fact, it may well be that the very high incidence of neuroticism among ourselves follows from the decline among us of such effective spiritual aid.” Ibid, p11. “For they actually touch and bring into play the vital energies of the whole human psyche. They link the unconscious to the fields of practical action, not irrationally, in the manner of a neurotic projection, but in such fashion as to permit a mature and sobering, practical comprehension of the fact-world to play back, as a stern control, into the realms of infantile wish and fear. And if this be true of the comparatively simple folk mythologies (the systems of myth and ritual by which the primitive hunting and fishing tribes support themselves), what may we say of such magnificent cosmic metaphors as those reflected in the great Homeric epics, the Divine Comedy of Dante, the Book of Genesis, and the timeless temples of the Orient? Until the most recent decades, these were the support of all human life and the inspiration of philosophy, poetry, and the arts. Where the inherited symbols have been touched by a Lao-tse, Buddha, Zoroaster, Christ or Mohammed – employed by a consummate master of spirit as a vehicle of the profoundest moral and metaphysical instruction – obviously we are in the presence rather of immense consciousness than of darkness. And so, to grasp the full value of the mythological figures that have come down to us, we must understand that they are not only symptoms of the unconscious (as indeed are all human thoughts and acts) but also controlled and intended statements of certain spiritual principles, which have remained as constant throughout the course of human history as the form and nervous structure of the human physique itself.” Ibid, p257. 30. “The effect of the successful adventure is the unlocking and release again of the flow of life into the body of the world.” Ibid, p40.